July | 2014 | CAN YOU HEAR ME NOW! Jesus has told us to “Study Humility and the meaning of it”. This is not something given to you as a gift or a badge of honor to wear. Humility is a reflection of a price you had to pay which brought you low. No man who stands on a pedestal that he himself has erected has humility. Surely this is an idol erected to commemorate his actions. Worry Not about striving to be humble.You cannot obtain this without trials. Is that not the most perfect explanation that the Lord could’ve given? I’m saying…wow! Just wow, wow and WOW! Following below is a video message on this subject, I hope it came across in a way we all can understand…if not, I tried! 2 Consider it pure joy, my brothers and sisters,[a] whenever you face trials of many kinds, 3 because you know that the testing of your faith produces perseverance. 4 Let perseverance finish its work so that you may be mature and complete, not lacking anything. 5 If any of you lacks wisdom, you should ask God, who gives generously to all without finding fault, and it will be given to you. 6 But when you ask, you must believe and not doubt, because the one who doubts is like a wave of the sea, blown and tossed by the wind. 7 That person should not expect to receive anything from the Lord.8 Such a person is double-minded and unstable in all they do. 9 Believers in humble circumstances ought to take pride in their high position. 10 But the rich should take pride in their humiliation—since they will pass away like a wild flower.11 For the sun rises with scorching heat and withers the plant; its blossom falls and its beauty is destroyed. In the same way, the rich will fade away even while they go about their business. Remember what this sign says for it is true…the Lord is coming to judge the Hearts of Man and to see what lies in each and it is there, He will decide on our reward or our judgment as the heart truly cannot lie. What is in your heart? “Step forth child – you’ve had stillness for long enough. Write clearly child, My Daughter, for what you write is now coming alive in Me – all from Me – and is My doing as I allow all the good and all the bad to bring who is Mine to Me and those that are of the enemy to him. Walk in My Light now for every minute matters. Speak child what I lay upon your heart. Speak what My Holy Spirit confesses to you as it is My Will that shall be done and this child, is a time of great rewards and great judgment. Promises to My Children will be complete…watch for this to manifest in full-sight to all. Look not to anyone but to Me, your God, your Father for I AM who I AM! Little are the hands that I hold and large and mighty are the Heavenly Hands that left you up to where you reside, near Me. Roost in My Barn and crow sitting on the branch of My Tree of Life. Remove all that holds you hostage to this world. I know each and every one of you and I have planned steps of your life with resolution at My Perfect Time. Call out and call in those that wait for word of Me and what comes – what I have spoken and unleashed. Quickly child – speak up to those that I have set you in front of – use not your own wisdom or words, only My Heavenly anointing upon your spirit will allow My Truth to be told for without it, your speech is of you, from you and not from your Father in Heaven so listen to My Voice, My Words, My Spirit for what I say child is now for all. Woe to those many that parish as they lift their eyes to the falseness of the earth – the god of that world and they will not see Me until the time of departure has passed. Daughter, all must now watch the days ahead with clarity of mind, spirit and faith; discernment will be given to My Children so none are wooed by the enemy and away from Me and their Heavenly placement. Have not a faint heart but be My Heart of Hearts. Reside in My Garden and you will be ready to stand on solid ground and My Promise. Daughter, dig your feet in…remove the noise of confusion so your watch time is full-filled as the Watchman you are. I say watch now for My Clock has turned and it now sets at the 12th hour, judgment time for many. Separation to the United States as they and their land will be divided for those who led My once beloved country are no longer of Me. They too are workers of inequity awaiting for their crowns to rule. Pray for her and My Beloved Israel as her walls too come tumbling down. Watch the pavement break and become brittle. See My Hand punish what was warned and watched over as My Wrath surely holds back My Written Word no longer and now, all shall reap what they sow. “More today – this is not a contest of who hears Me more or who hears Me less. It is who I know My Words will reach and how many ears will hear. You must believe what I have sent you to find – only I could have closed the gaps you may have fell through landing in a different place than you are now. I brought you here to bring you home – ALL OF YOU My Children! Your sons, your daughters, your mothers and your fathers now walk to the station to wait your arrival. They will be the first faces you see as you take your first steps in Heaven where you now reside. I AM the Giver of Good Gifts! I AM not the god the enemy would have you believe as I excite in your happiness and smile. I give you this Word now children so you see I hold all Promises and I keep what I have made with you for I have loved you before you were born. Mourn not for loved ones gone – they rejoice now that they are here with Me and are singing Me high praises for what I now do. 14 This is what the Lord says: “As for all my wicked neighbors who seize the inheritanceI gave my people Israel, I will uproot them from their lands and I will uproot the people of Judah from among them. 15 But after I uproot them, I will again have compassion and will bring each of them back to their own inheritance and their own country. 16 And if they learn well the ways of my people and swear by my name, saying, ‘As surely as theLord lives’—even as they once taught my people to swear by Baal—then they will be established among my people. 17 But if any nation does not listen, I will completely uproot and destroy it,” declares the Lord. As I was watching Fox News this morning, I happened to see the story of the Arizona Death Row inmate who was put to death via lethal injection…or should I say who they tried to put to death only he lingered for a few hours before the poison took affect, thereby leaving the whole country in a irate irritated state, upset with the way the United States is putting their condemned prisoners to death. All are now saying, “There must be a more human procedure, simpler way to do this!” and alas, the door will now be opened – death by guillotine will soon be introduced. I remember, I think, the last prisoner they tried to execute did not die immediately either; he too lingered for a longer period of time thereby again, causing outrage. See, see the pattern? They are making their case for a less painful, quicker yet effective way to execute people in this country and now, they have their excuse to move forward and bring all options up front and center. Oh, didn’t know that this country has approximately 30,000 guillotines just waiting to be seen by the unknowing, yet still trusting public? Yes, sorry to be the one to tell you this but they have been unpacked, polished and set-up, not-yet collecting dust at many of the military bases around this great country of ours. I can just hear the argument now about how this is the “best” way to do things now because we cannot allow another to die in such a horrific way as these last 2 prisoners have. Oh, they are good but you know, we are better because we are aware, standing firm with our eyes wide open and can recognize a pre-planned set-up when it’s plastered in front of us each and every day. Thank you Lord Jesus for your Spirit of Discernment upon your children! In the first few seconds of that news clip I watched, I knew this was the time they were to make their move and would start rolling out this death device that is prophesied in the Bible and used to full-fill God’s Word. Can you say “beheading” with an allegorical view or doubt in your voice now? Nope, didn’t think so. Again, Jesus has already showed us how these will part of the Tribulation and used, literally and this was total confirmation for me today that it is coming quicker than the people of this good country can imagine…pray for them for it will be their heads that will pay the price. 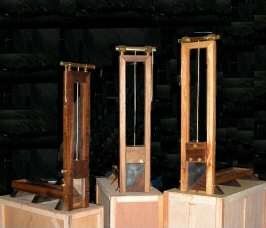 Where would the proposed Georgia Legislature guillotines have come from unless the United States government was in fact holding these some 30,000 machines and were going to replace them to be used as the best possible “death penalty” option? I just finished reading this amazing story regarding Israel’s battle to stay alive or at least the Jewish people’s plight to stay alive. I just cannot imagine going through what these people, God’s People, go through each and every day and for some, it’s been their entire life experience. It’s funny and sad at the same time, what the world chooses to see, believe and deny. Most have become immune to the truth and enamored with the lie while the ones in between, well, they just don’t care as long as their life and the lives of their family members stay at a constant “status-quo”. The following story showed me the kindness and the compassion God Himself placed in His People, even though their eyes are not open to Jesus, the True Messiah and Son of God, they love their enemies and their neighbors. It showed me they forgive over and over even when their surroundings tell them not to. They have not let their hearts become hard and tainted as I’m sure Satan tries so hard to do…instead, they strive for peace…a peace that will never come. I think now, at this time in history, the Jewish people are beginning to realize that like never before. Please pray for our Sister Israel for God says “Those that bless Israel, I will bless and those that curse Israel, I will curse!” Pray not only for peace and safety of these wonderful Jewish neighbors, but also that their hearts remain soft, loving and warm and that the devil’s plan of hardening them is foiled for good…just like the plots of the Muslim-led attacks against ALL God’s People. Thank Him for the faithfulness in the Israeli Army for their continuing effort and determination to save their small, yet powerful and blessed country, God’s special gift to the Jews for years of wait and promise, Israel. Also, this was posted the other day and many of you may have already seen/read it but for those who have not, enjoy! WHAT IS OUR WAIT FOR? EXTENDED MERCY FOR THE LOST & MIRACLES FOR US! 2 New Videos Posted July 11, 2014 – (These have the same info but one is off-beat with the sound/voice and video speed so I re-recorded another video but left some things out…please watch both! Thanks! Jesus Not Delayed, Just Extending His Mercy~Don’t Doubt & Remember YOU KNOW HIM!